Easy to install and like that we can open the window from the top for airflow without the rain coming in. Give your home privacy and cooling shade with this cordless cellular light filtering shade that has an easy to use top down or bottom up lift. You can allow light into the top part of a room while gently filtering in light in the bottom part or vice versa. The shade blocks 65-percent of light to diffuse harsh sunlight and create a welcoming glow. 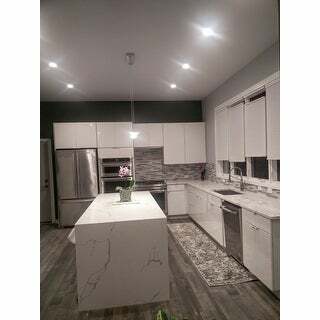 With a simple design and white color, the shade matches any decor and is generally approved by most HOAs. The cordless lift mechanism is safe for homes with children and pets. Type: Cordless Lift, Cellular Shade, Privacy/Light Filtration Shade. Product Features: Energy efficient, softens incoming light, opens top down or bottom up, inside or outside window mounting capability. Material: Polyester, high-quality point bond fabric. Care instructions: To clean the fabric on the shade, spot clean, use a feather duster, or vacuum lightly using the soft brush attachment. Dimensions 35.0 In. X 5.0 In. X 3.0 In. We're renting a house with lots of oversized windows and great views. The privacy of top down/bottom up blinds are perfect, but we didn't want to invest a lot of money in our temporary living situation. Arlo Blinds gave us a reasonable option for a front living room window that is 95" wide x 48" long. A custom cellular blind of this style is over *** . Instead we purchased 2-46.5 wide x 48 long shades (total *** w/free shipping) from Arlo for that window and it worked out perfectly. The blinds and hardware look like a good quality, they work very well, and we're perfectly happy with them. Husband said the instructions weren't very good and a couple of pieces of leftover hardware weren't identified and we still don't know what they're for, but apparently we don't need them (kept them just incase). Being a handyman, he found them easy to install using his battery screw gun. We have other long, odd sized windows we'll be purchasing same blinds from Arlo-that's how pleased we are with them. They give very good privacy without having to add a curtain. 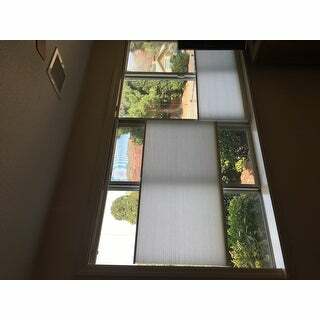 These blinds are good quality and very easy to install. The material up close looks gauzey, but from a few feet away you cannot see the detail, especially when the light shines through. Installation was simple except for the pull tabs you use to lower/raise the blinds. The instructions say to put them on from the side AFTER hanging. Unless you are a professional circus acrobat put them on BEFORE hanging by removing the plastic end piece and sliding them on at the end, pulling them to center. For inside mount, we ordered .5 inches narrower than the inside width (measured at top, center and bottom and used the widest measurement, then subtracted half an inch) and it fit perfectly. The length was a couple inches longer than needed but because of how the blind folds you cannot see the extra length when in use. I would describe this color as a cool white, and in my opinion they filter about 50% of the light when fully extended and provide very good privacy. My 60" long blind folds to about 4 inches when fully closed, not including head rail (which adds about an inch if folding at the top). They are narrow enough to look nice folded at the crossbar of the window, which is a convenient if you want to raise and lower them easily throughout the day. My husband installed the top-down bottom-up cordless cellular shade this evening and I like the fact that it can be used in two different modes. I can bring the top down to let sunlight in only from the top part, push the shade up to only have sunlight come through the bottom part. It looks awesome in our master bathroom. I think I may purchase a few more for the bedrooms. Clearance is not built into ordered size. No instructions on how to order for size. I ordered 32.5 inches as that is the exact measurement of my window opening. ALL OTHER blind sites tell you to order by your window opening size and the blind will be made with proper clearance built in. I chatted with Overstock customer service and was PROMISED a reply in 24 hours on how to measure. No reply. UGH So not wanting to miss out on my soon to expire 15% off coupon, I ordered by the instructions on several dedicated window blind sites. I wanted to mount inside the frame but they are 1/8" to 1/4" too wide. Of course to do an outside mount it is recommended (not by Overstock mind you, remember no instructions) to order at least 2-4" wider than the window for light gap coverage. So these are completely unuseable for me and have to go back. I'm still trying to figure out where the 3/8-inch part of these blinds is. The header measures 1 1/8" deep the fabric measures 1" deep. I assumed they would be a nice little shallow blind. I liked the fabric and the mechanism seemed fine. Nice cordless shades. Decent amount of light filters through them while providing privacy. Came with all the components to mount inside or outside window frame. Great blinds. Easy to install. I like the cordless and top down features. Operates smooth and easy. I recommend these blinds for light filtering. Great shades that were easy to install. I had gotten quotes from a custom shade store that charged over $250 per shade and based on their sample, the material of the shades were about the same. Highly recommend if your window size works with this DIY option. I really like this shade. It is light filtering and that is exactly what it does. It was very easy to install and operate. It has the top down option that I really like when I want some light in but don't want anyone to see in. I would recommend this shade to my friends. Pros: Looks nice. Top down, bottom up cordless feature works well. Easy installation. Cons: Width size of shade is about 1/8 inch larger than stated so I can not put shade up or down inside the window frame. I have to wiggle it out of the frame, move the shade up or down, then push it back in place. My window opening measures 35 inches exactly. Love it! It's just what I needed to block out the neighbor and still let light in the top. First purchased these from Home Depot for double the price. Checked online and found these and decided to give them a try. Very good guality. I will be ordering more for my new house. Top down shades are a great idea. They give you privacy yet still allow natural light to come in the room. So many friends have asked where To get them. I just wished they had room darkening option for the bedrooms. These shades came promptly and look and work great. Fantastic customer service when my husband broke one of the brackets during installation. They promptly sent more brackets free of charge. I definitely recommend these shades for the price. 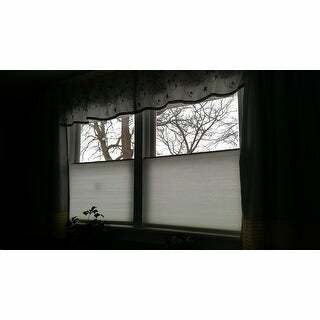 Love Them for my bay window !!! Perfect for my bay windows above my tub !!! I applied a clear craft treatment with a leaded glass look on the top 1/3 of the windows , and lowered the blinds just to meet the bottom of the faux leaded glass window! Early arrival too ! Blinds arrived on time packaged nicely. 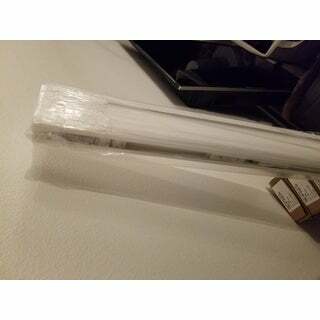 Quality was as hoped and the color was exactlky what I wanted for l ight filtering blinds. I have never owned top down bottom up blinds before but the install seems tok be simple and these look as if they will hold up. They did however send the wrong size for one of the blinds . Unfortunatemky I will have to send it back which will cost more mokney and the deal will no t be as good as originally expected. Wish they could have got the size correct. S.
Love the top-down bottom-up design. We updated our kitchen window treatments with them. They looked very nice! For the money these are good. They were easy to install. Light filtering and provide privacy. I mainly use the top-down method to open them and that is what I was looking for. Great buy. Absolutely love how elegant and beautiful my kitchen looks with this blinds. Easy to install. easy to install, however the nuts are tool long. I really like that these up-down shades. I use them in the bathroom and it is nice to lower to top for light while leaving the bottom down for privacy. Good quality and they are still working just fine after a year of use. Worth every penny. Ordered the exact measurement of my window and it turned out perfect. Super easy installation for a first timer. Go for it! I LOVE my new shades. I can let sunlight in through the top and still keep my privacy. They let a nice amount of light in and seem to keep in some of the heat. These shades look great and perform well. "My husband installed these and I just noticed the magnets are on the bottom of the shade instead of the top so they don’t latch in from the top Did he install incorrectly or did they get put together incorrectly He says they came that way Sorry for the lack of punctuation My phone won’t do it"
"My window measures 83” wide x 58” long. Would I go with two 40” x 60” blinds?" "I have a 5 foot window. Should I purchase two 24.5 to install side by side?" 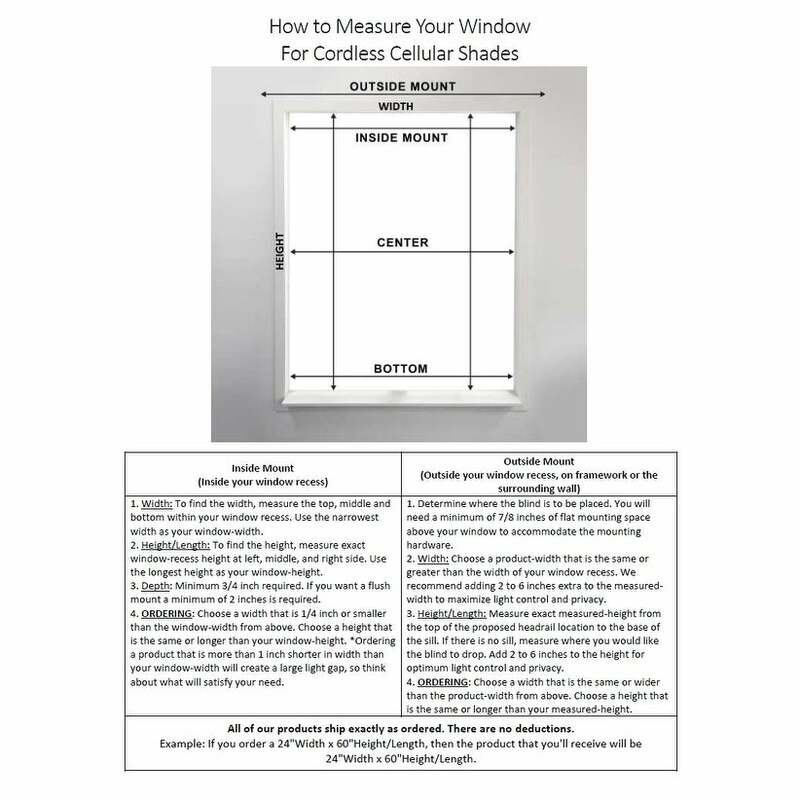 A five foot window is 60 inches, which would need ta shade that would total to approximately 59.5 inches to properly mount inside of your window frame. The 24.5-inch shades will leave a light gap of 5.5 inches on each side of your shade. "Can I order a custom 19” wide shade?" "Can this product be used on a door?" Yes these shades can be mounted as an outside mount. Yes, you will want to measure for an outside mount, and make sure you have the necessary flat surface measurement to account for the brackets. 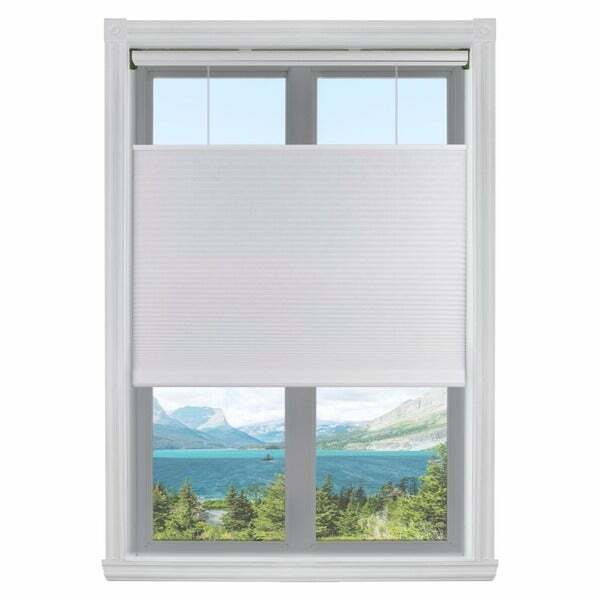 "With the top-down bottom-up feature can you realize a setting where your only cover the bottom third/half of a window or will the unused part always stay in the middle of the window as in the picture?Thank you"
The top and bottom of these shades will meet in the middle. You will not be able to lower the top of the shade all the way to the bottom third. I have these blinds and I sometimes cover only the bottom third/half. The ropes are exposed going up to the top when you lower the blinds that way, but that looks fine to me. "Is this blind made in a 28" width to be available at a later date? My window is 28.5" and with the added hardware dimension, I'm afraid ordering that size (available now) will be too big." We do not have this shade available in a 28" width.